NHTOM had the most liked content! Amen to that. Bill told me in February that he wasnt on because the Delta wasnt an advertiser, and he stays there,... something to that effect. Still makes no sense, Why would he care? I know his last post was about his on board fire extinguisher, a couple of folks replied and i dont think he liked the replys. That was Last year... Ice took exception to a reply someone gave him on his trip in early February and he replyed back. His reply was removed and I guess that was enough to cause him to go MIA. Its a real shame because we all go to this site for real time info from the serious riders who live there. Their knowledge, stories, advice is what made this site. I cant offer diddly from down here in Cow Hampshire about anything current up there. The reality is we are rewarded by Iceman, Bill and others being on here, They dont really get much back in return, so when they go, its Our loss. 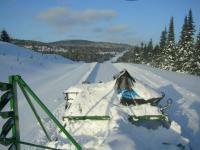 Looks like mid-winter up there still Groomer! Even the river is still tight.Great day to be a wind mill owner. Thanks for another another super report Alaine! I agree with you on liking the hard smooth trails. They're the best How many miles/kilometers do you typically ride in a season? Just curious. I know this is Icemans reporting page but as of yesterday, heres what I saw. From Shawinigan over to St. Raymond there is close to 4 feet of snow on the ground. Only in 2008 have I seen deeper snow there. Reggie and Pascal have a crew in today to clear the roof on the low units at the Drakkar. Unless it gets very warm, or a big rain, this area should run deep into March. I got Lasik in Montreal in 2002 for the same reason. I use to wear contacts when I rode, but some days when it was super cold I could actually feel them getting crunchy. Best medical outcome ever. Great idea. Thats always the weak point. Dont know if any folks on here saw todays temps. Its -18F at 1pm in St Michel, -14f at Shawinigan. Nasty cold. Today is one of those "test your helmet and shield" days that Im glad Im missing. $160 HJC full face, w/ electric shield . I run with no breath deflector, cant see bringing extra snot and saliva along for the ride. I carry spare cords in case of issues. i wear cheap sunglasses as long as its above 0F(-18c) without issues. Super cold weather and they fog.. Have had the odd temporary failure, but its almost always at the connections. Dry em off, good to go. But, you have to be easy on the connection where the wire meets the helmut. That is the delicate point that can break, and then the wires move at the shield. Been running similar setups for 15 yrs. Despite the fact that he smoked like a chimney ( I think Du Maurier stock dropped 50% upon news of his death), I never saw Bernard drink. Always coffee and butts. What a guy. He had an edge, but he our backs as well. RIP Bernard.